When it comes to selecting waste and recycling machines, 'Fit for Purpose' no longer means just lifting. 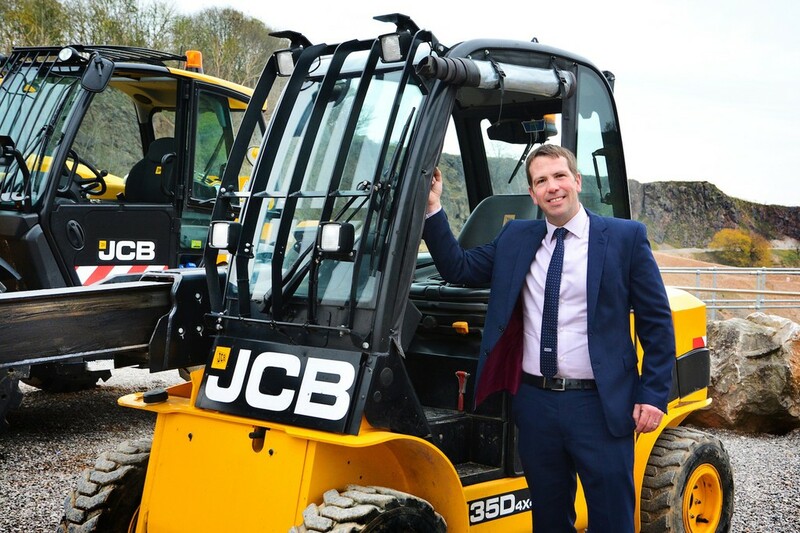 David Banks, Sales Manager - waste & recycling sector at JCB, offers a deeper definition. The waste and recycling industry is a tough business that puts machines through their paces. Naturally, a machine will need to be 'Fit For Purpose'. But what does that mean exactly? Obviously a machine should be able to lift, place, or shift materials. But being fit for purpose in the modern waste and recycling facility requires much more. The broad range of tasks that machines are expected to perform every day in these sites has evolved – as have user expectations of the machines’ capabilities to deliver a successful operation. Machines must be designed to meet these requirements, working in facilities that are generally operating long hours, handling increasing volumes, are open to the elements and are occupied by a mix of staff and visitors. Only by fulfilling the following key purposes, will a machine fulfil the expectations of a waste and recycling site. 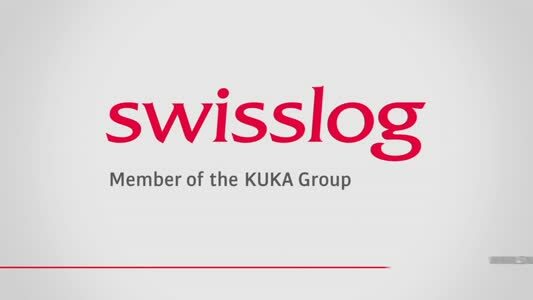 Efficiency is the first key purpose – with economical fuel consumption being a prime factor. A fuel-efficient machine will contribute to your profitability while also providing a cleaner environment to work in. The power unit, being the heart of the machine, is the key to fuel efficiency: the right power unit should meet the latest emissions regulations and deliver fuel consumption savings without sacrificing the top quality performance. Not an easy task in an environment where the jobs are getting tougher. Power coming from an engine that meets Stage IV/Tier 4 Final is a major contributing factor to a machine’s fitness for purpose. Aimed at reducing the hazardous exhaust emissions of new vehicles sold in the EU and North America, these are latest stage of the engine emissions regulations, which apply to off-highway machines. Clean engine technology can also help performance and reduce maintenance, which will minimise downtime. The JCB EcoMax Stage IV/Tier 4 Final engine range for example, requires no Diesel Particulate Filter (DPF) to meet the latest standards. With no DPF components to maintain and service, operating costs are reduced. In addition, a lack of bulky DPF components results in a smaller engine package, hence a more effective machine design. The Ecomax engine has been recalibrated to achieve the engine out emissions requirement resulting in a further 5% fuel saving. A compact selective catalytic reduction unit with a urea-based additive is used on engines above 75hp (55kW) and is incorporated into a single exhaust muffler, in many cases replacing the existing exhaust. This provides a ‘one can’ solution, delivering the same compact overall dimensions for machine designers. 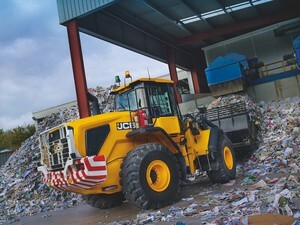 The technology is used across most of JCB’s 35-strong Wastemaster range. Having the right machine for exactly the right application will fulfil the productivity purpose – machines designed for specific applications will be able to maximise productivity through seamless operation. Waste and recycling sites are harsh environments, presenting a challenge for any machine; this makes it essential to get a machine that has been designed for the job. 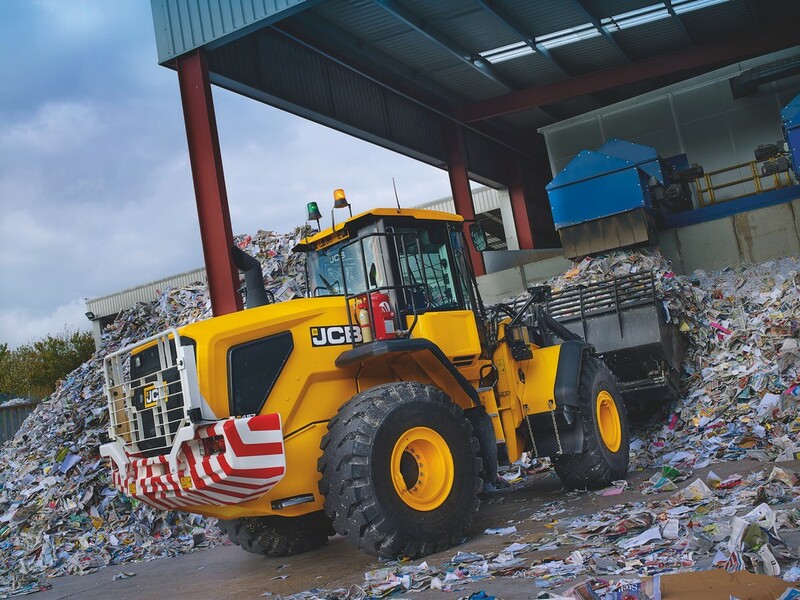 For example, JCB’s 457 Wastemaster is designed to work in high output transfer stations and materials recovery facilities, where large volumes of material need to be handled. Typically the machine will be used to load hoppers and trucks and stockpile MSW (Municipal Solid Waste) and other recyclables. 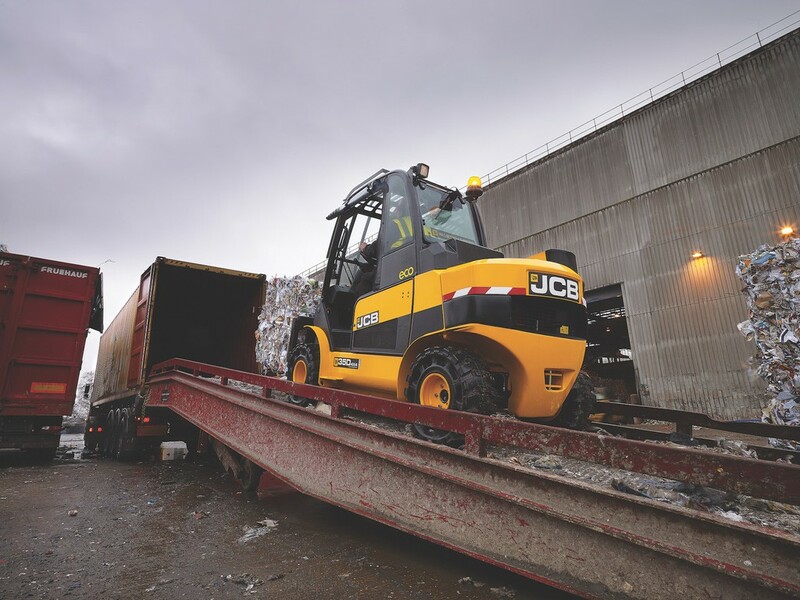 Where there are operations such as loading and unloading of trailers that need to be carried out in confined spaces – there’s the JCB 35D 4x4 Wastemaster Plus Teletruk. Its ability to reach forwards to lift and place loads quickly and safely allow operators can load and unload delivery trucks from one side – trumping the traditional forklift truck often used in this application, saving up to 50% of yard loading space and allowing them to drive right inside shipping containers. Of course there are many other jobs that require different types of machine – the array of which is highlighted by the fact that JCB has 35 different vehicles to handle different tasks in its Wastemaster fleet. When selecting a fleet of vehicles to carry out different tasks on a single site or a collection of sites, it makes sense to source all of the machines from the same supplier. This will simplify finance, maintenance and even provide a uniform visual appearance. A supplier should therefore offer a broad range that can offer a choice of vehicle to deliver optimum output to the last available kilogram of waste material. A bespoke build for each individual machine should also be offered to the customer to ensure the machine meets their recycling and waste handling needs precisely. Contributing to a safe working environment is an essential purpose for any machine used in waste and recycling. There should be zero compromise in safety in terms of the machine’s design. This means constantly examining ways to take into account every potential eventuality, and leaving no stone unturned in the pursuit of complete safety and comfort for everyone within the work place. Whether it is loose materials or large containers; hazardous substances or heavy machinery; slips, trips or falls, there’s a lot of potential danger at waste and recycling sites. Manufacturers of machines play a vital role in helping to increase safety for employees and visitors to sites through the design and development of new machinery. There are many protection features that can enhance operator safety and minimise any damage to machines, even when working in harsh environments. To fulfil the purpose of contributing to a safe site, the machine used on that site should be designed to provide excellent operator visibility, vehicle visibility, access, operator comfort, operator protection, lighting and technology. Telematics provides complete assurance and reporting on the things that matter most, thus ensuring that the machine can continue to be fit for purpose on a daily, weekly, monthly basis. Reporting through telematics ensures maximum uptime by understanding when there are faults that need to be rectified, when services are due, or identifying inadequacies in performance. There are further productivity gains that can be made through better management information and performance monitoring. Fleet managers and owners have remote access to real-time fuel consumption and machine working data – including operating hours and fault codes. Having the ability to ‘geo-fence’ your investment using Telematics, ensures you are notified in real time should a machine leave a predetermined area. This provides assurance that the equipment is being used in accordance with the tasks set out. Telematics that incorporates a tracking system will help protect the investment in the machines on a waste and recycling site. JCB’s LiveLink, for example, shows the location of a machine and has helped recover over £3 million of stolen JCB equipment. These check points provide an outline guide to consider whether a machine will be fit for purpose to work in a waste and recycling site. The best way to assess these points, and see if the machine really is fit for purpose, is to try out a unit as well as alternative machine options. After all, you wouldn’t buy a car without taking it for test drive, so why make that investment without knowing the machines could do the job?